Well folks, it’s here. 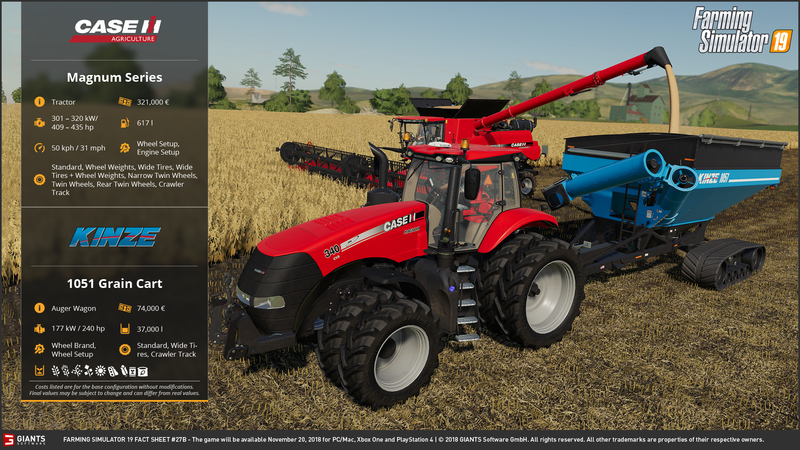 The final Fact Sheet Friday before Farming Simulator 19 officially releases on November 20. You may have seen some coverage of the game on YouTube and Twitch already, and I too have been playing the game, working on putting my initial thoughts together in a review in progress to be shared with you next week. But first, GIANTS Software has provided us with one final set of fact sheets to show off the details on a few more pieces of equipment. This week’s fact sheets show us some pretty seriously large equipment. Here they are! 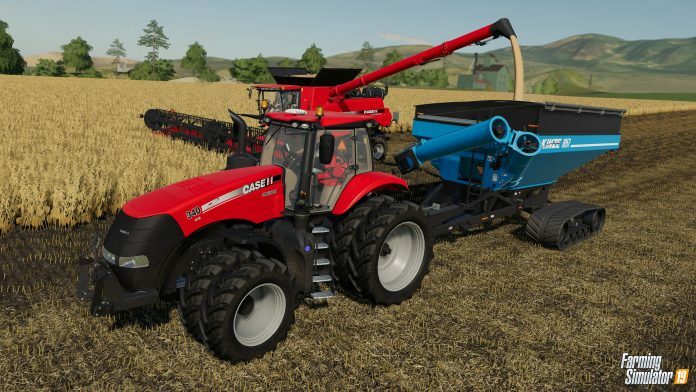 The Case IH Axial-Flow 9240 isn’t new to Farming Simulator fans, and I’m sure many will be delighted to see it returning yet again. This combine harvester gives both the John Deere S790 and the New Holland CR10.90 a run for their money, with a capacity of 14,400 litres and 634 horsepower. It looks as though you’ll be able to swap out the crawler track for wide tires if you’d prefer that look, as well as choose the brand of the tires. 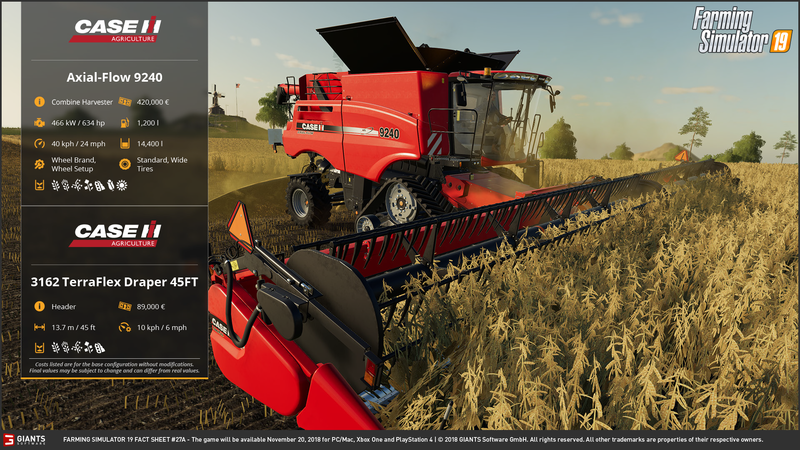 I’ve seen many players excited to see Kinze announced for Farming Simulator 19, and here we get our first close-up look at one of their grain carts. This auger wagon (also known as a chaser bin) can hold 37,000 litres and has several tire options, including a crawler track and wide tires. It will require 240 horsepower to operate, so you’ll need a relatively strong medium-sized tractor to pull and unload this wagon. It’s nice to see a new entry in this area of the shop, and the light blue will add some variety to the colours you see out in your fields! Challenger is back with the same models that we saw in Farming Simulator 17, and they’re obviously just as beastly this time around. With a range of 380 to 431 horsepower, this machine will pull many of the larger implements available. It may have a slower top speed than most tractors, but that doesn’t mean it can’t get the job done! The MT700 also has the option of 3m tracks, which are slightly thinner than the standard setup, but set wider on the tractor. The Amazone Cenius 8003-2TX Super is a relatively mid-sized cultivator, offering an 8 meter (26 foot) working width to the tune of a 400 horsepower pulling requirement. Working at 15 km/h (9 mph) will likely be standard across most, if not all, of the cultivators in the game, so this looks like it will be a nice choice for players looking for a fairly large cultivator without breaking the bank or needing a Case IH Quadtrac. 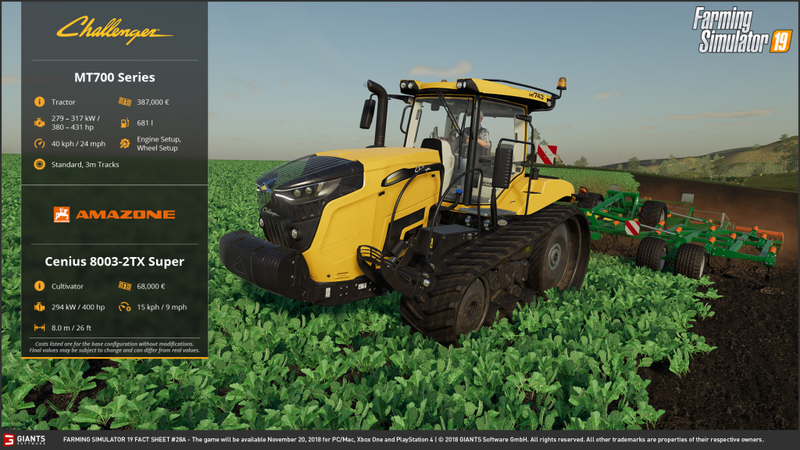 And that is all she wrote for Farming Simulator 19‘s fact sheets! I appreciate those who have read them over the past weeks and months, and provided kind feedback about them. This doesn’t mean the end of Scholarly Gamers’ coverage of Farming Simulator 19 though, so be sure to stay tuned for even more to come both before and after release! Reuben's a desk jockey with a wife and two kids, and when he wants to get a little crazy he'll stream some Farming Simulator on Twitch. If you want to be bombarded by tweets about simulation games, go follow him on Twitter. With Scholarly Gamers, our team hopes to deliver a reporting platform above and beyond the standard set forth by loads of other media sources. We look to bring about critical thought and examination to a number of themes, technologies, implications, and more when it comes to the games that we share a passion for. © Copyright 2018 Scholarly Gamers | Designed and powered by CQMS Inc.